Fusarium wilt of watermelon is an aggressive fungal disease that spreads from spores in the soil. 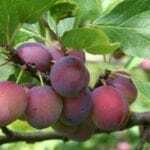 Infected seeds are often initially to blame, but once fusarium wilt is established, it can be transmitted by anything that moves the soil, including wind, water, animals and people. What can you do about watermelons with fusarium wilt? Can the disease be controlled or treated? Let’s consider how to manage fusarium wilt on watermelons. 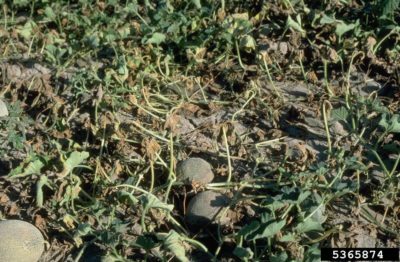 Fusarium wilt of watermelon is a specific disease that can’t be transmitted to other plants, including cantaloupe, cucumbers or others in the same plant family. 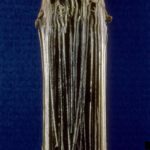 Although infection occurs when spring weather is cool and damp, fusarium wilt can show up on the plant at any stage of growth, any time during the growing season. Mature plants are better able to handle the disease than seedlings, which often collapse. In its early stages, fusarium wilt of watermelon is evidenced by stunted growth and wilting that shows up during the heat of the afternoon, rebounding in the cool of evening. As the disease progresses, wilt becomes permanent. Diseased leaves turn yellow or dull green, often becoming brown, dry and brittle. The infection, which enters through the roots, usually takes over entire plants but may be limited to one side. If you break or cut a stem, fusarium is easy to spot by the brown vascular tissues within. After the plant wilts, you’ll see masses of tiny spores on the dead vines. In some cases, you may not notice watermelons with fusarium wilt until the hot days of summer, especially when plants are stressed by drought. Any melons that develop are abnormally small. Plant disease-free seeds or transplants. 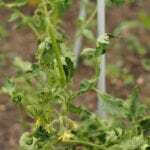 Look for fusarium-resistant tomato varieties. No variety is 100 percent free of risk, but some are more resistant than others. Practice crop rotation. 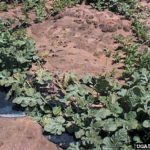 Don’t plant watermelon in an infected area for at least five to 10 years; the disease can live in the soil indefinitely. Clean garden tools before moving to an uninfected area. Destroy infected plant matter by burning or in sealed plastic bags. Never place infected debris on your compost bin.